NOTE: You are purchasing a standalone product; MyNursingLab does not come packaged with this content. 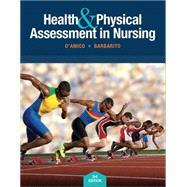 If you would like to purchase both the physical text and MyNursingLab search for ISBN-10: 013416296X/ISBN-13: 9780134162966. That package includes ISBN-10: 0133876403 /ISBN-13: 9780133876406 and ISBN-10: 0134160754 /ISBN-13: 9780134160757. Donita D’Amico, a diploma nursing school graduate, earned her baccalaureate degree in Nursing from William Paterson College. She earned a master’s degree in Nursing Education at Teachers College, Columbia University, with a specialization in Adult Health. Ms. D’Amico has been a faculty member at William Paterson University for more than 30 years. Her teaching responsibilities include physical assessment, medical-surgical nursing, nursing theory, and fundamentals in the classroom, skills laboratory, and clinical settings. Ms. D’Amico coauthored several textbooks, including Health Assessment in Nursing and its companion clinical handbook by Sims, D’Amico, Stiesmeyer, and Webster; as well as Comprehensive Health Assessment: A Student Workbook and Modules for Medication Administration with Dr. Colleen Barbarito. Ms. D’Amico is active in the community. Within the university, she is a charter member of the Iota Alpha Chapter of Sigma Theta Tau International. She also serves as a consultant and contributor to local organizations. Colleen Barbarito received a nursing diploma from Orange Memorial Hospital School of Nursing, graduated with a baccalaureate degree from William Paterson College, and earned a master’s degree from Seton Hall University, all in New Jersey. She received her Doctor of Education from Teachers College, Columbia University. Prior to a position in education, Dr. Barbarito’s clinical experiences included medical-surgical, critical care, and emergency nursing. Dr. Barbarito has been a faculty member at William Paterson University since 1984, where she has taught Physical Assessment and a variety of clinical laboratory courses for undergraduate nursing students and curriculum development at the graduate level. Dr. Barbarito coauthored two books with Donita D’Amico–Modules for Medication Administration and Comprehensive Health Assessment: A Student Workbook. She published articles on anaphylaxis in American Journal of Nursing and Coping with Allergies and Asthma. Her research includes physical assessment and collaboration on revising a physical assessment project with results published as a brief in Nurse Educator. As a faculty member, Dr. Barbarito participated in committees to explore curricular change and to develop multimedia-learning modules for critical thinking. Dr. Barbarito is a member of Sigma Theta Tau International Honor Society of Nursing and the National League for Nursing.